Our all rounder Retro range of paddle boards are best for flat water, cruising and surfing. A great beginner and competitively priced board with a traditional styled nose and shape, this board gives you great stability and buoyancy for all riders. 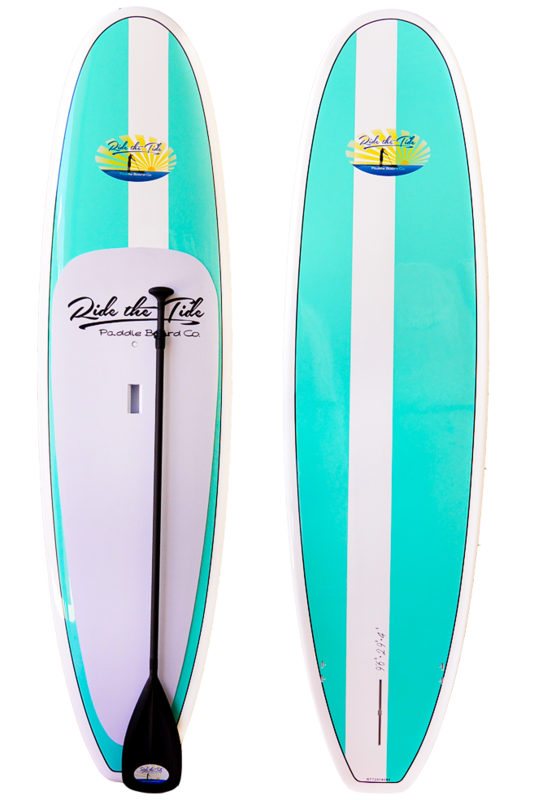 Our Seafoam stand up paddle board, is a beautiful and clean designed SUP sporting our signature retro stripe in a beautiful aqua and white, both front and back. Finished with clean white rails with black pinstripe and featuring a white textured deck pad. Using our latest and most innovative technology - ARMOUR-Tech - is a step above the rest in construction in our popular all-round, entry level series of boards. Adapting Vacuum Formed Technology using an advanced ABS shell casing, our newest range of ARMOUR-Tech boards are 6x tougher than an epoxy fibreglass board. • Impact and abrasion resistant, our AMOUR-Tech paddle boards boast a Kevlar integrated rail guard offering unbeatable toughness. • Ultra-durable and lightweight, our ARMOUR-Tech SUPS are responsibly crafted using sustainable, reclaimed materials. Excess material is then repurposed creating less waste in production. • Efficient and smooth in flat water and great in small surf, our all-round shape and wide planing nose combined with fuller volume rails offers the best stability and greater buoyancy. • Beautifully hand crafted featuring our signature retro colours and a soft textured deck grip. BUNDLE Board Bag, Paddle Bag, Leash, Rail Tape - SAVE $150! PROTECT YOUR INVESTMENT! Quality great, enjoying the experience, feel like a kid with a new toy..
Super happy with my new SUP purchase! Cherie was really helpful and I loved the protection Pack I bought with it. Such a great price and company! I still can't get over the quality of this board - it's full fibreglass! It was so affordable and comparing it to other SUPS on the market for this price it is by far the best out there hands down. Customer service 5 star! Buying another for my partner.